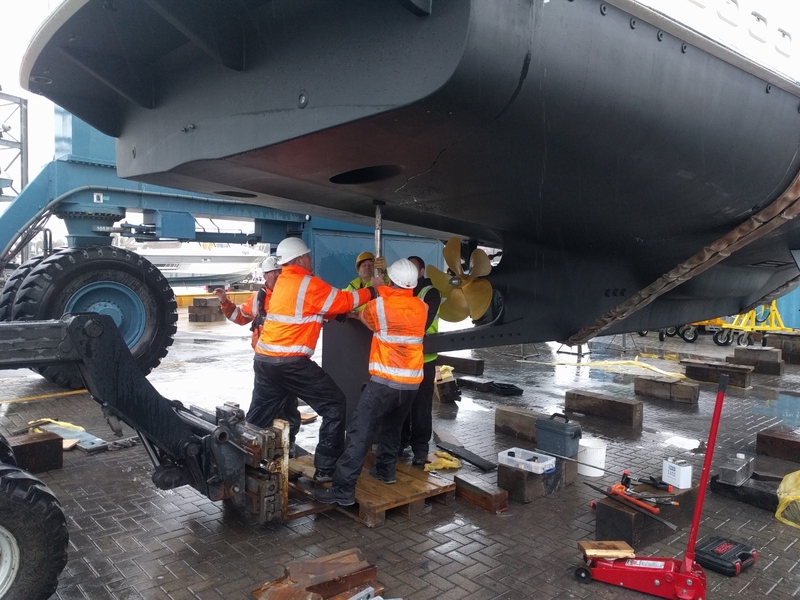 The final major project we completed at Saxon Wharf in Southampton was replacing the cutlass bearings on the rudder shaft and the wing and main propeller shafts. 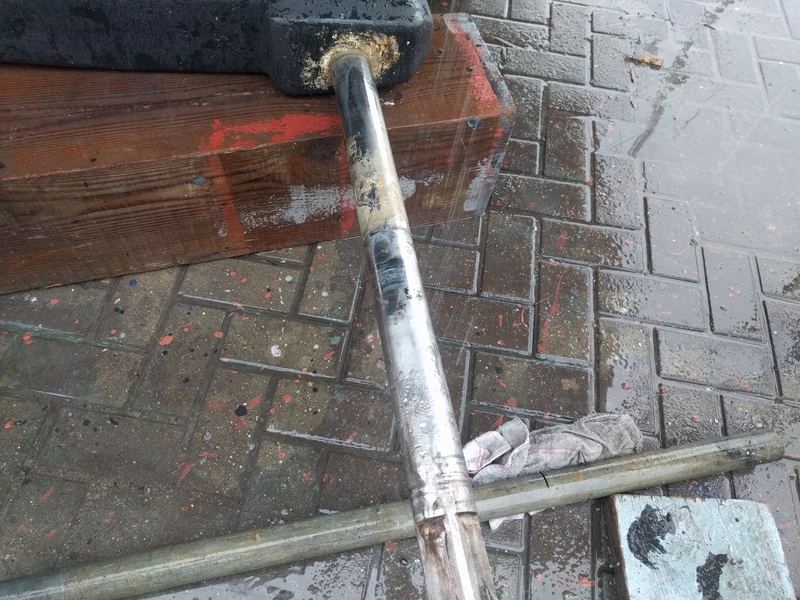 On inspection after removing the cutlass bearing, our main propeller shaft was badly corroded with some of the pits running quite deep, so we opted to replace it during the job as well. 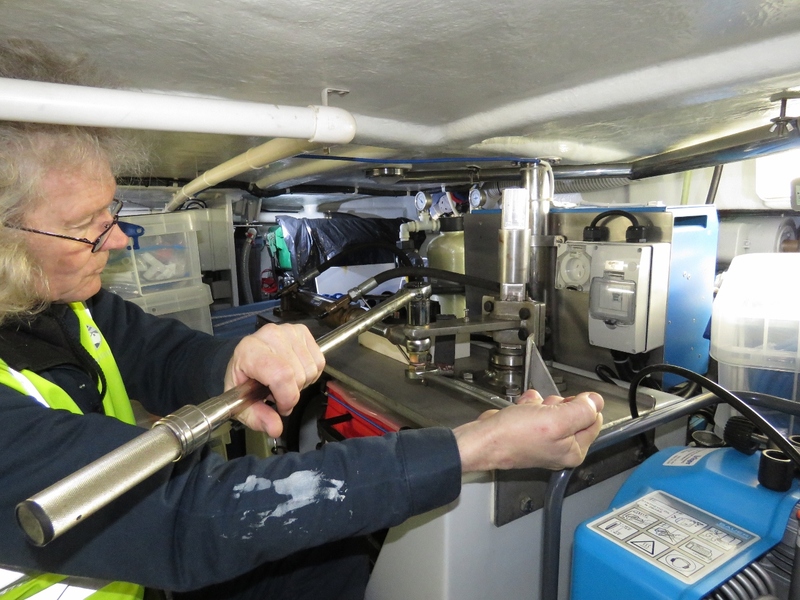 James using our largest torque wrench to loosen off the rudder arm bolt in preparation for rudder bearing inspection and replacing the rudder packing. The Gori wing propeller disassembled. 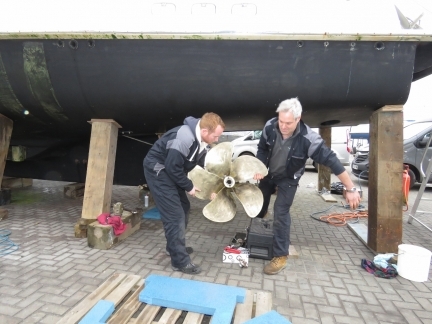 Roland Mcildowie and Jack Woodford of Proteum removing our main propeller in preparation for changing the cutlass bearing. 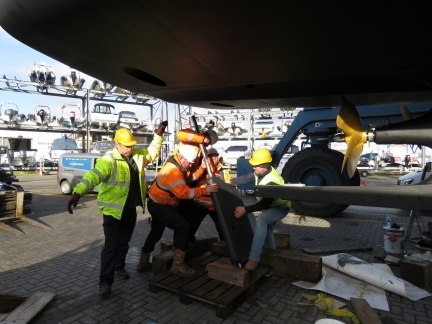 Our main propeller hasn’t been off the boat since we took delivery. It’s a hefty beast. 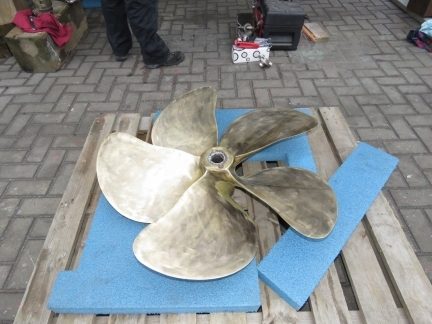 The main propeller shaft with the propeller removed. The plate just above is where the Spurs shaft-mounted cutter system mounts. This is designed to cut small lines that might tangle in and disable the prop. 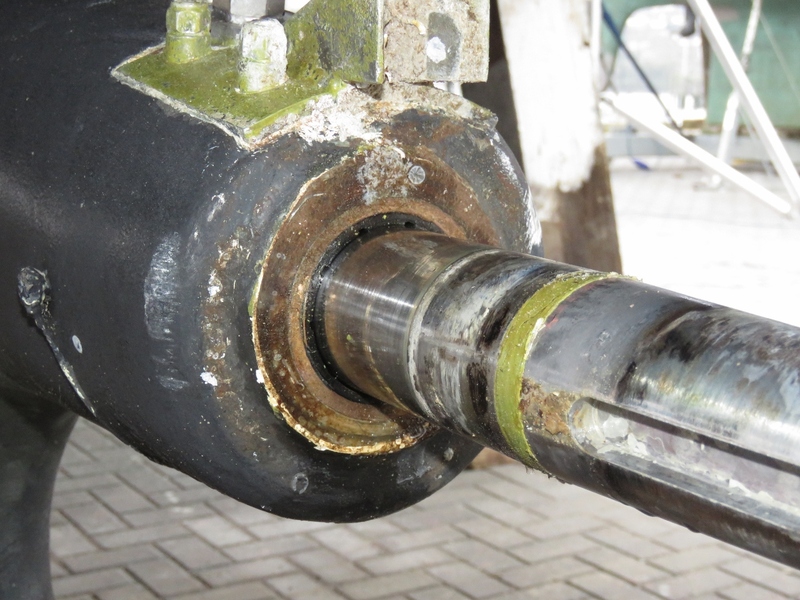 A close-up of the main shaft at the cutlass bearing. You can see some rust and pitting in the main shaft, but the two inches of cutlass bearing wear surface is looking excellcnt. 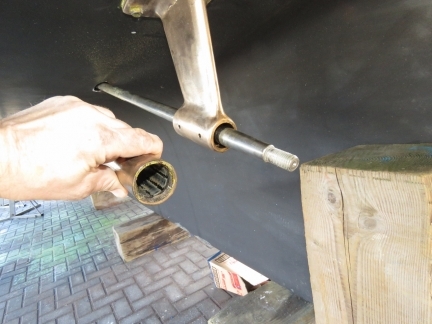 Large bolts from the couling betweein the propellor shaft and the transmission flange. Our main propeller shaft out. 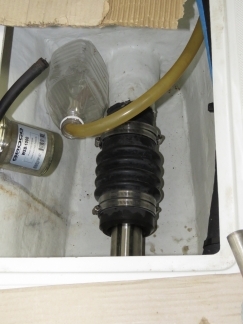 An Aquamet 22 shaft should last well and show very little corrosion with even extended use. For some reason, this shaft is badly corroded and some of the pits run quite deep. It’ll need to be replaced. 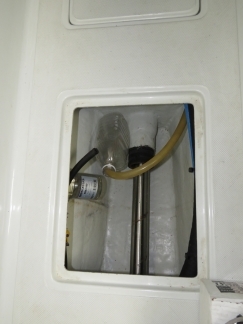 Update 1/15/2018: Although the current Nordhavn 52 specification uses an Aquamet 22 shaft, it turns out back in 2010 Aquamet 17 was used. 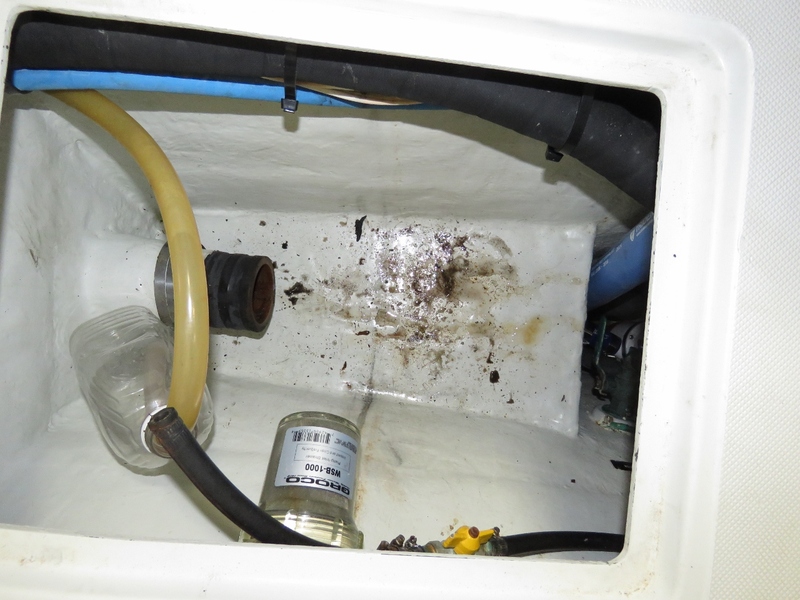 Understanding its not Aquamet 22, the failure isn’t that surprising. Current-generation Nordhavns will experience much better lifetime. James holding the old wing engine cutlass bearing. You can see at the bottom the inner rubber material has come free from the outer housing of the cutlass bearing so it needs to be replaced. 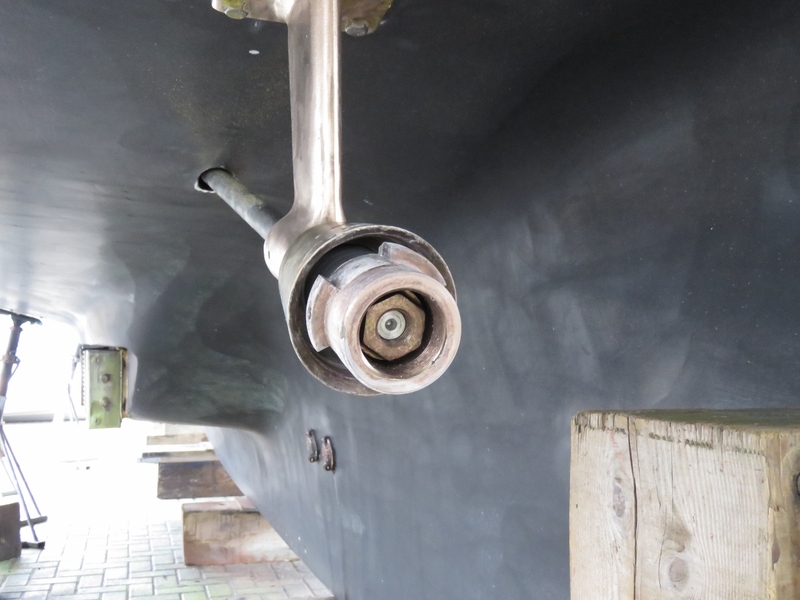 You can see how the cutlass bearing has come apart and the rubber has slipped down. 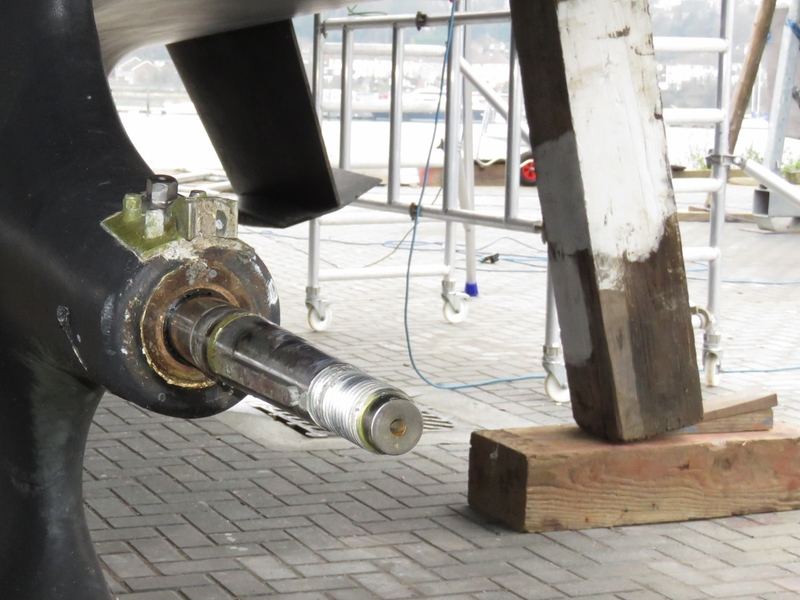 The propeller shaft-to-transmission coupling resting in the lazarette. It’s been removed to allow the propeller shaft to be slid out of the boat. 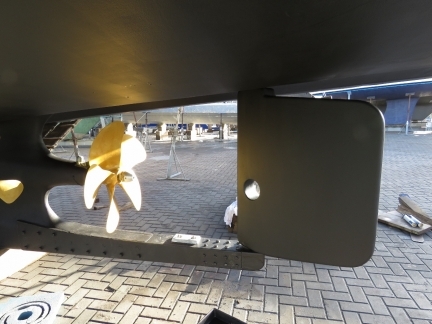 It looks a little odd in the bilge without the propeller shaft there where it should be. James holding the spur cutter and talking with Roland Mcildowie and Neil Russel. 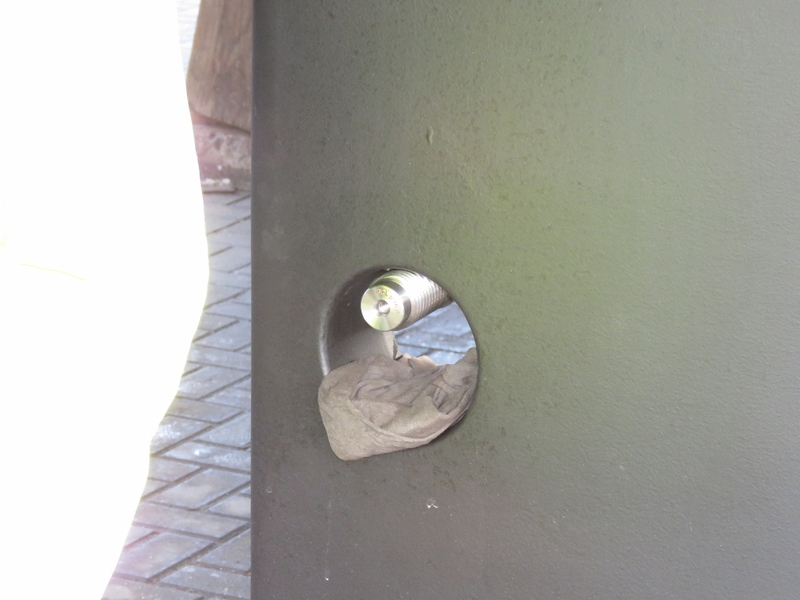 We’ll need to replace part of the Spur line cutters since an overzealous diver stripped the threads on the zinc attachment. Crated in the trailer behind is our prop shaft, with our old muffler beside it. Roland Mcildowie of Proteum reassembling the Gori wing engine prop. We removed the rudder foot to check the bearings. It looks like we’re going to need a new cutlass bearing and a new lower bearing on this stop. At E. French and Son to pickup a new lower rudder bearing they fabricated. 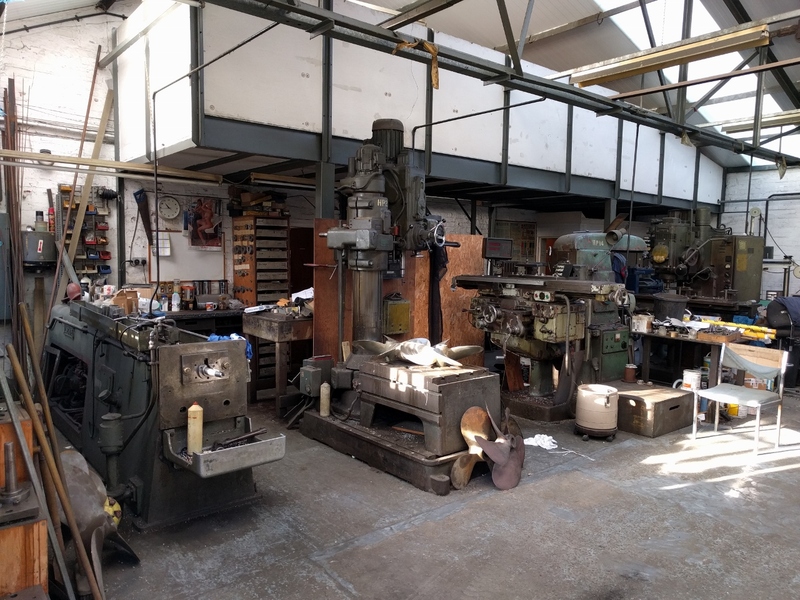 It’s amazing how much machinery they can fit in such a small place. 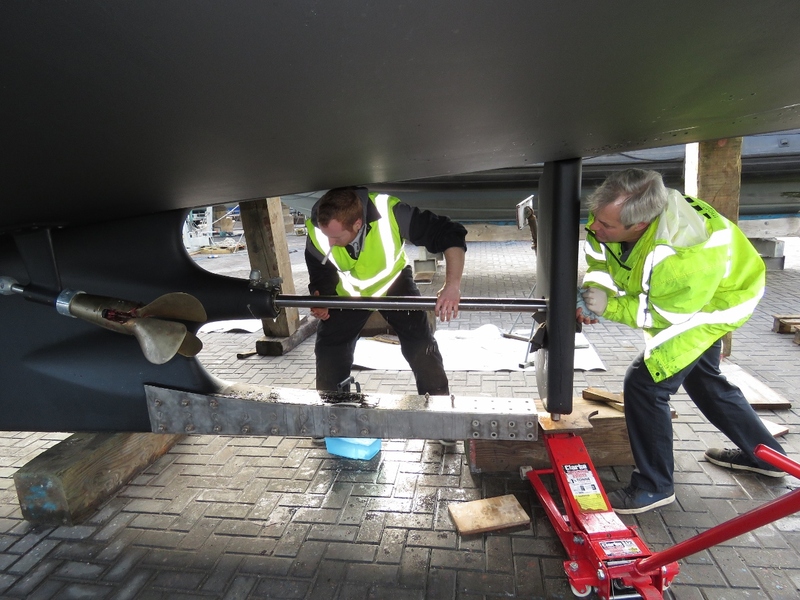 James installing the wing engine shaft zincs while Roland Mcildowie installs lock screws to finish off the Gori prop rebuild. 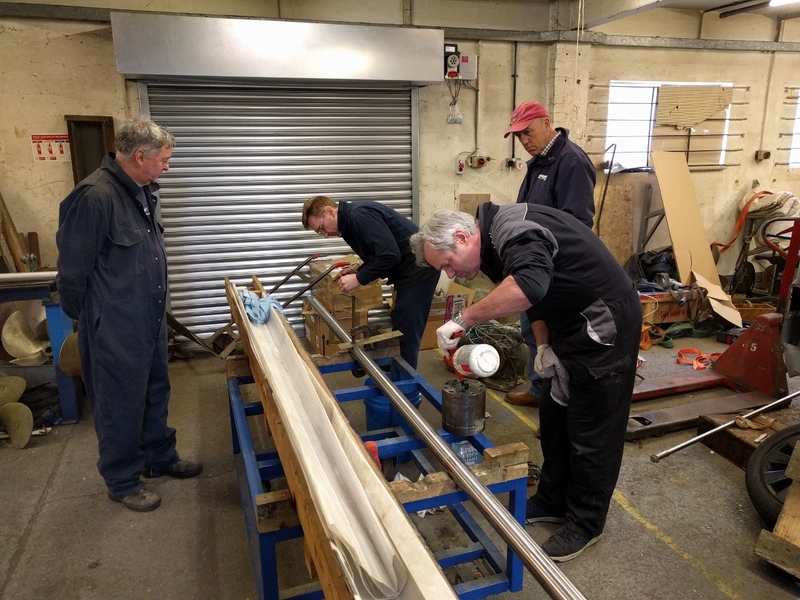 James installing the spur cutter zinc on the main shaft while Roland Mcildowie is going to drill a small dimple into each side of the main shaft cutlass bearing to ensure it’s properly secured. 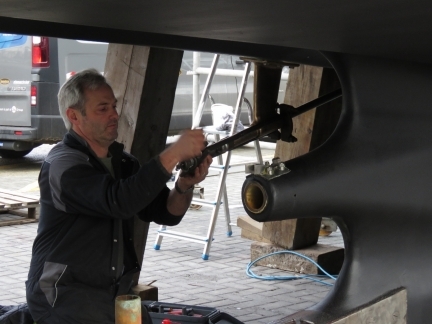 Roland Mcildowie of Proteum test-fitting the lower rudder bearing that E. French & Son made for us. 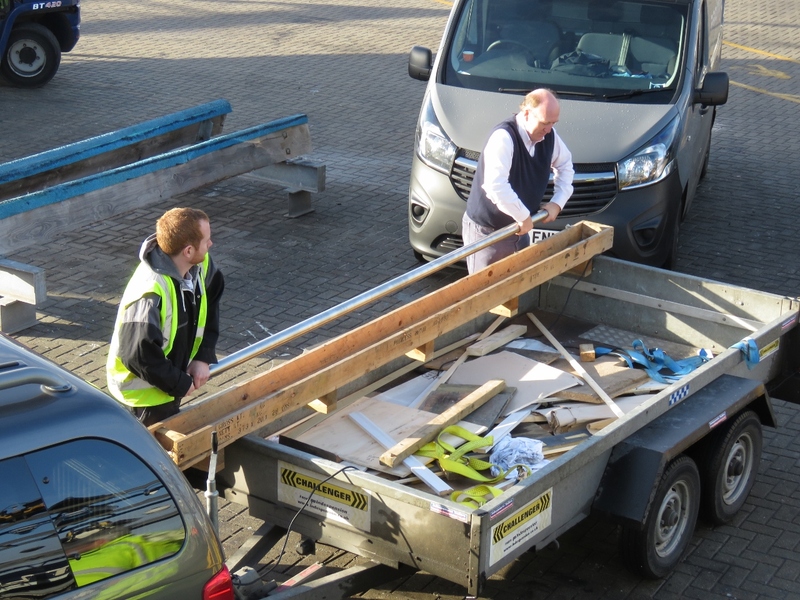 Back at Saxon Wharf, our new prop shaft just arrived. It had been delayed for several days waiting for an appropriate length piece of metal. 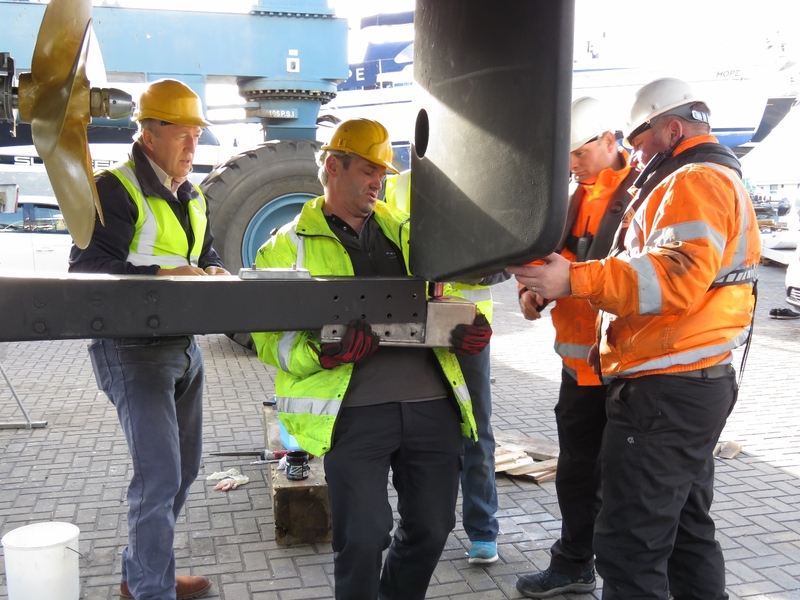 Roland Mcildowie and Jack Woodford of Proteum installing the new prop shaft. 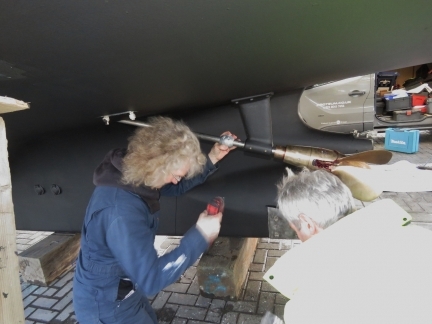 Our rudder has a hole in it to allow a prop shaft to be removed without dropping the rudder. The prop shaft just about to meet back up with the transmission. 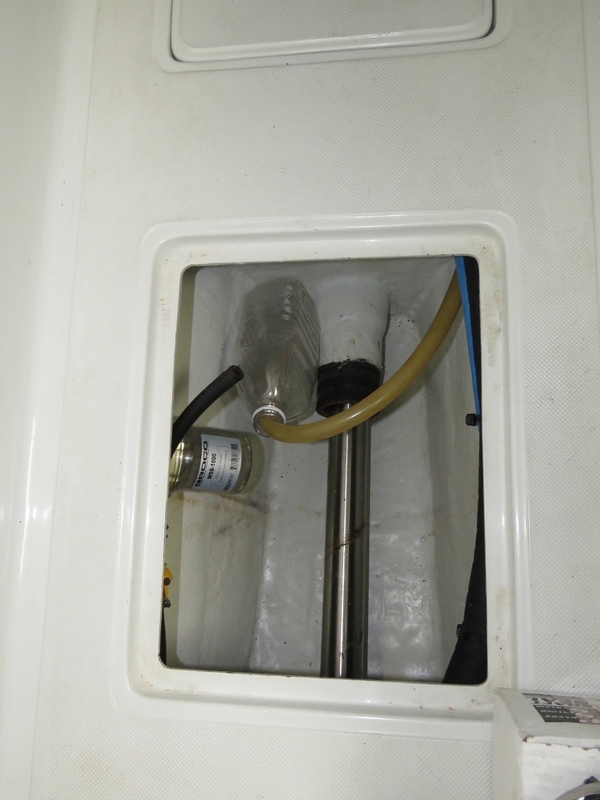 It’s nice to prop shaft reinstalled. Our new Packless Shaft Seal (PSS) in place. Jack Woodford of Proteum installing the rudder upper bearing. 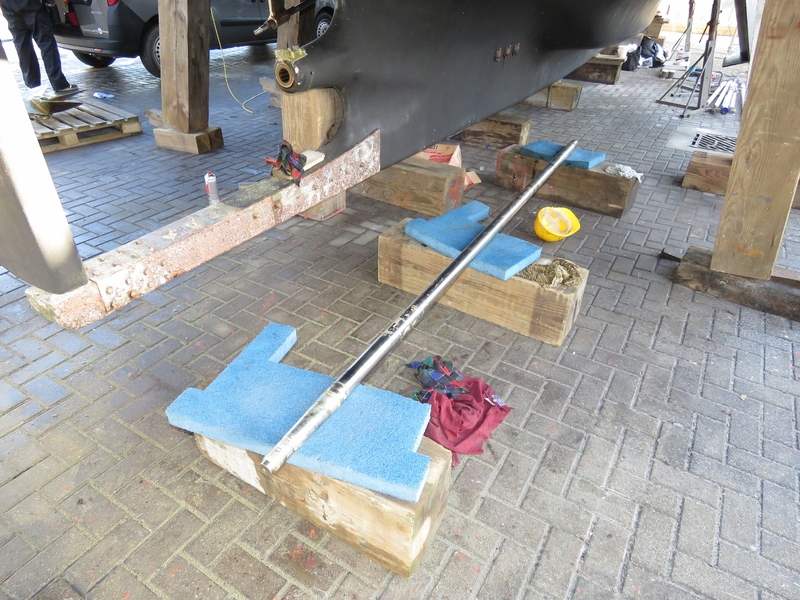 Saxon lifted the boat today so we could remove the rudder to replace its cutlass bearing. 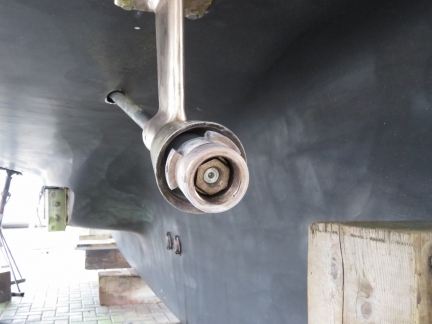 The rudder cutlass bearing is worn out, which isn’t that surprising given the hours on the boat, but it is strange that the rudder cutlass bearing is worn more than the main shaft bearing. We’ll also paint the places on the hull where the supports were. 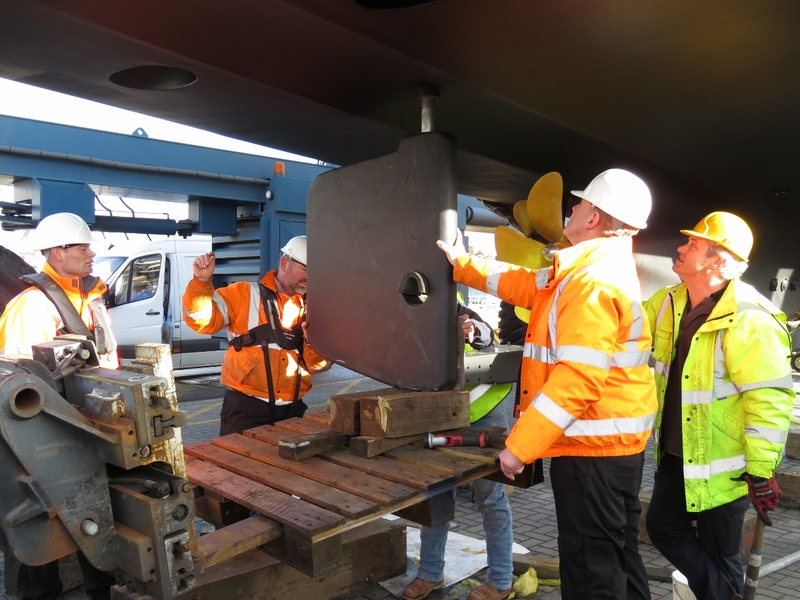 Members of the Proteum, Nordhavn Europe and Saxon Wharf crews supporting the rudder with a pipe while Roland Mcildowie of Proteum removes the rudder foot. With the rudder shoe off, Saxon raised a pallet into place to support and lower the rudder. Lowering the rudder out of the boat. The rudder off. That’s a first for us. 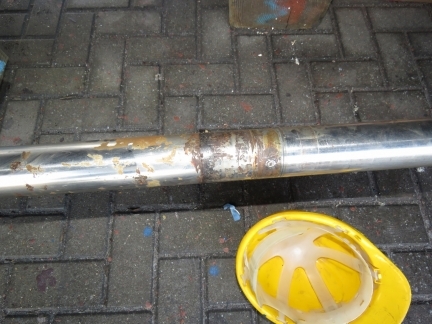 The rudder shaft appears in decent shape, with little signs of corrosion. 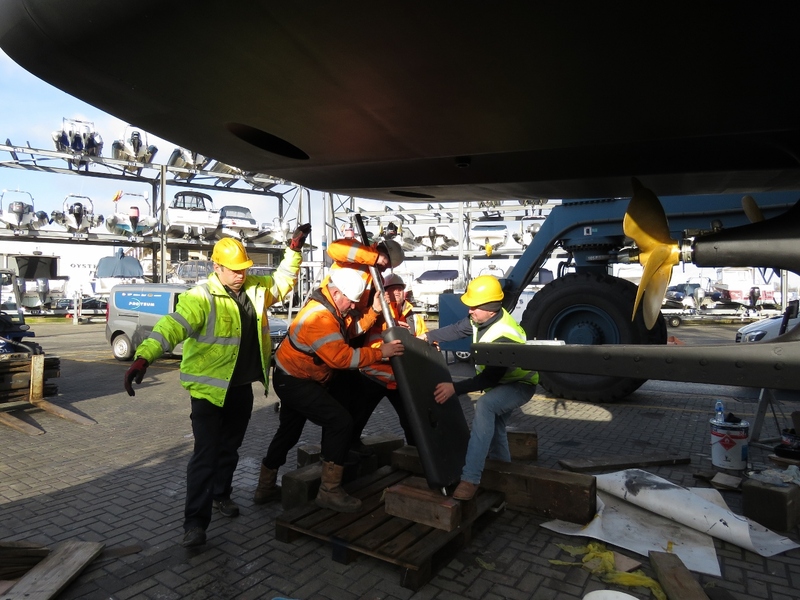 Raising the rudder into place for reinstall. Saxon Wharf using a forklift and pallet to slowly raise the rudder into place. 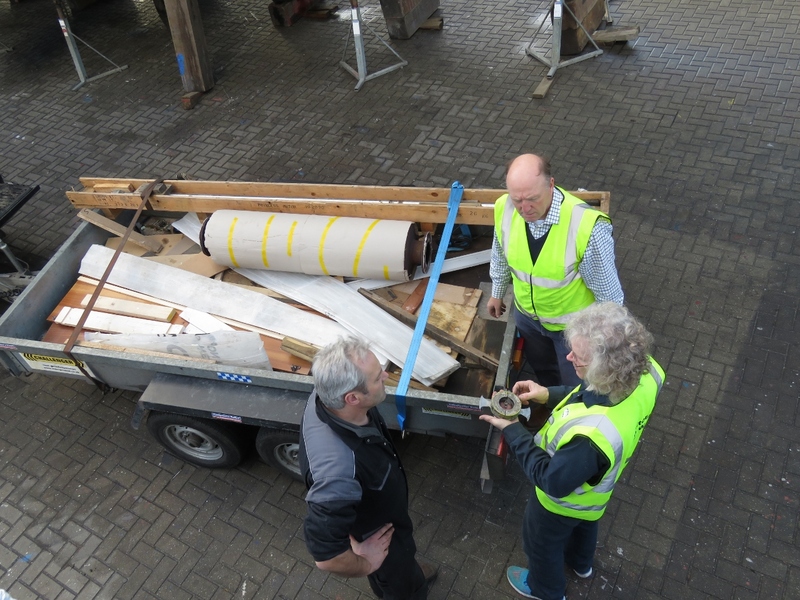 Mark, who is running the forklift, has an incredibly delicate touch. Roland Mcildowie placing the rudder shoe underneath the rudder. 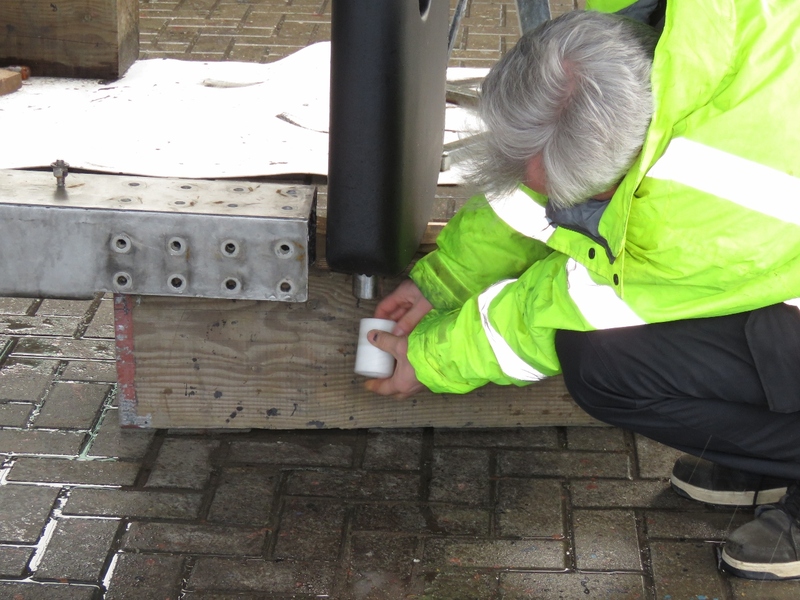 The rudder is in place, with the rudder foot painted, so we’re ready for launch. Dirona heading back into the water after nearly three weeks. Prior to this, the longest time we’ve even been in the yard is ten days. There’s still some work left to do that’s easiest done left in the water. We’ll move over the Hamble Point Marina and Nordhavn Europe Ltd. will finish it up. Testing at full throttle en route to Hamble Point is showing some minor vibration from the prop shaft area. 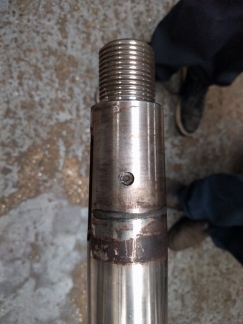 The prop shaft has 0.023″ of run-out and the current professional assessment is coupler-to-shaft misalignment. 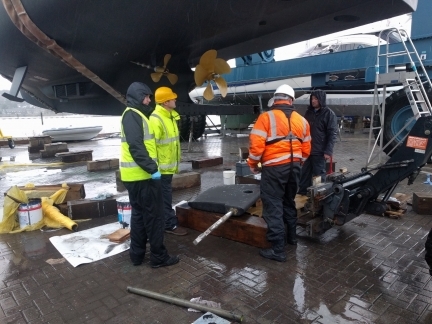 Dirona will need to be lifted out of the water and the prop shaft pulled out for everything to be remeasured and refit. So we’re back as Saxon Wharf this morning. 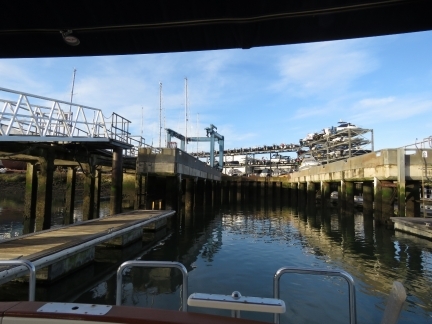 At Hamble Propellers Friday morning to investigate the prop shaft run-out issue. To better understand the prop shaft run-put issue, we brought the new prop shaft, the old prop shaft, the propeller and the coupling to Hamble Propellers for inspection. We might have found the issue with the propeller shaft run-out. It appears there was some metal transfer from the old shaft taper onto the inside of the coupling. Certainly this would have prevented an accurate taper fit. 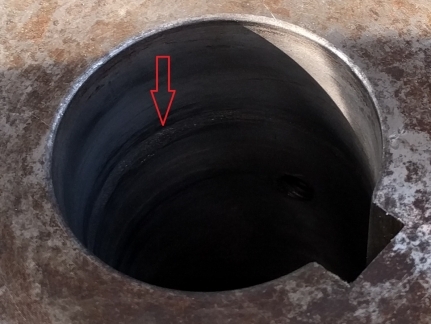 In the picture of the old shaft you can see a semicircle of metal came off. We don’t know if this is the problem, but it’s certainly a problem. There is a matching ridge of metal inside the coupling taper that appears effectively welded in place (see red arrow—click image for larger view). Monday the ridge will be removed, the taper will be lapped in then checked with machinist blue to ensure greater than 80% contact. Then the whole assembly will be checked for run-out on a prop-shaft-jig and then again in the boat prior to launching. 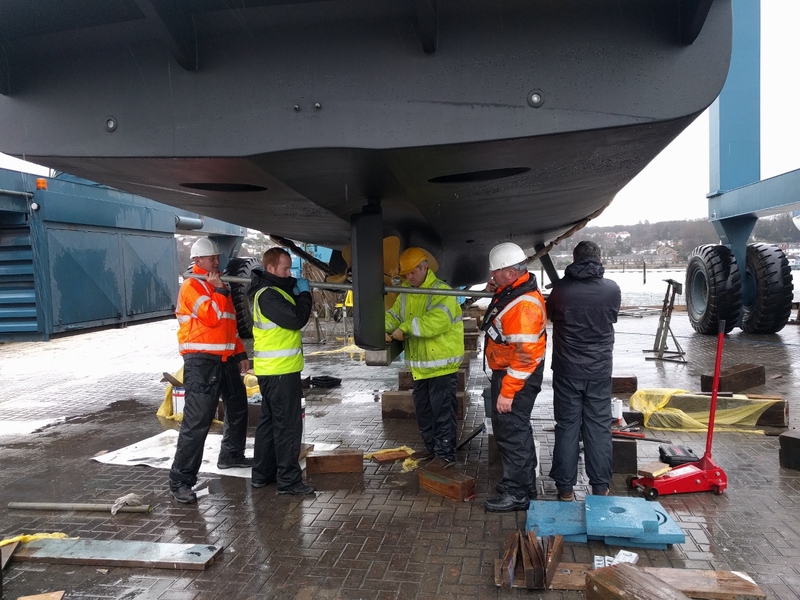 Engineers at Hamble Propellers working on our new propeller shaft. 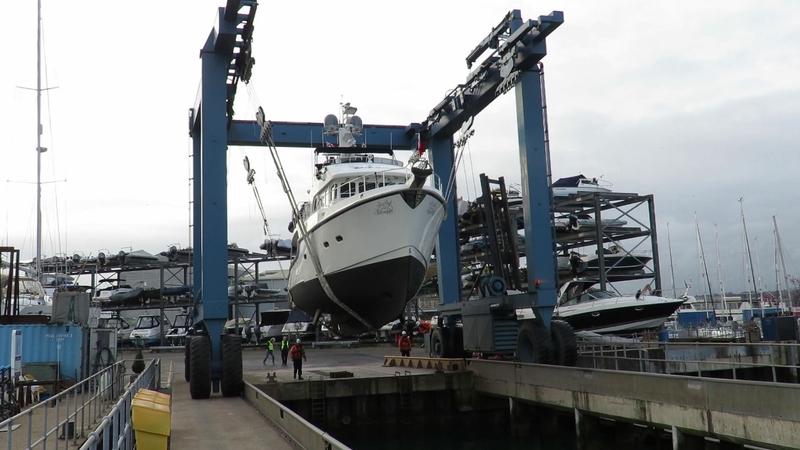 On the lift at Saxon Wharf for launch. 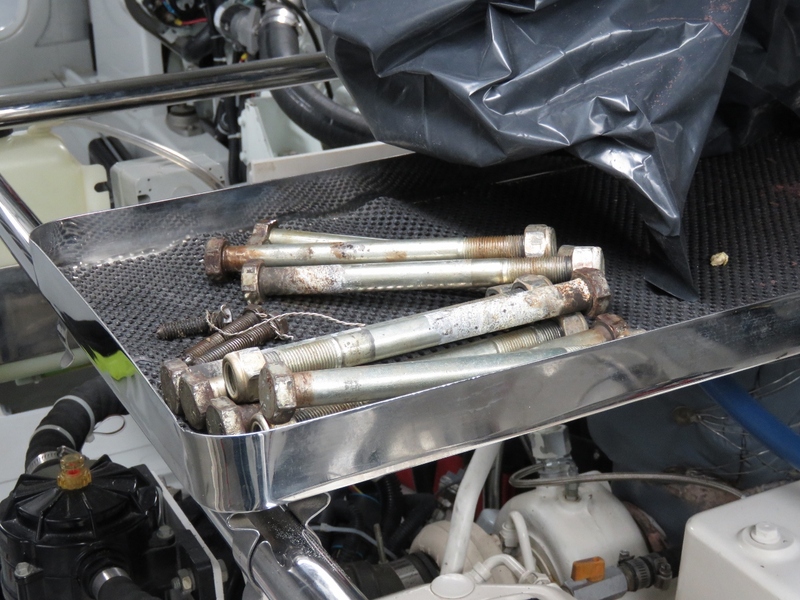 The prop shaft is slightly out of true or there is an alignment issue, but we decided that prop shaft alignment perfection was for boaters that don’t want to visit London. 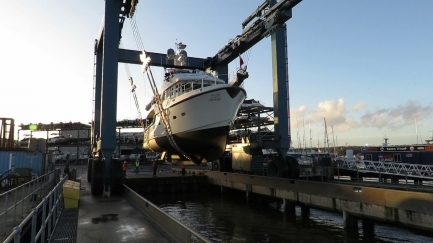 Technically, it’s slightly out of ABYC specs but it’s close and we bought the boat to enjoy the world rather than the yard (which was very nice but a month was enough). 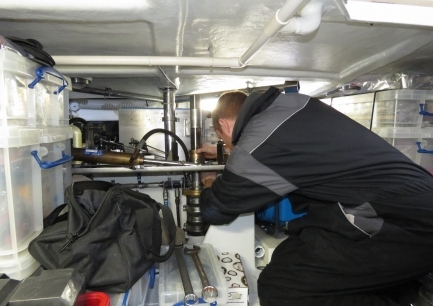 We’ll align the engine and check runout again in London. Update 4/10/2018: The prop shaft appears to be running within tolerance and without excessive vibration and all appears to be as it should be at this point. We’ll post an update here after we have had some usage but, at this point, it’s all looking as it should. Hi, thank you for a really interesting site. I have one question about PSS seals, was it the first exchange for your Trawler? If so, what kind of shape did the rubber look inside if you could possibly look into it? 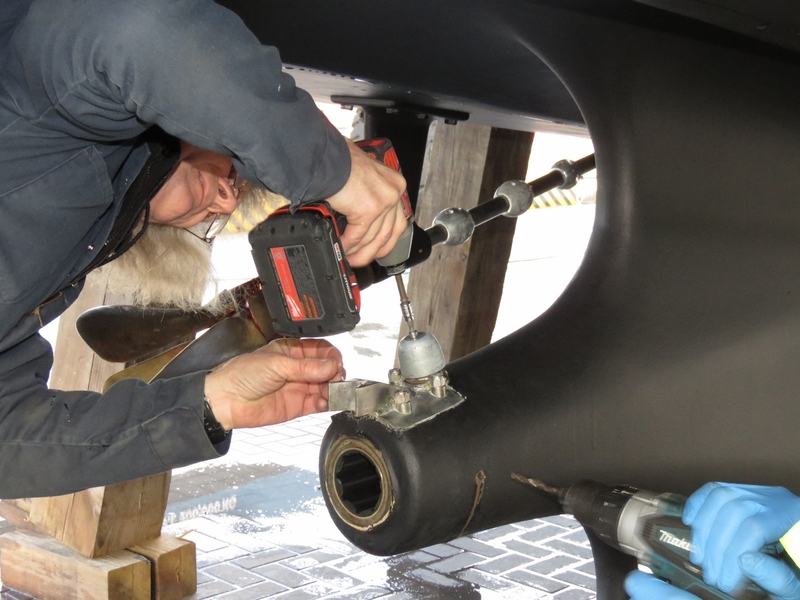 PSS instruction is to replace rubber every six years. I had the same seal NT-37 and thought about replacing when the rubber looks like a new one out and is 9 years old. 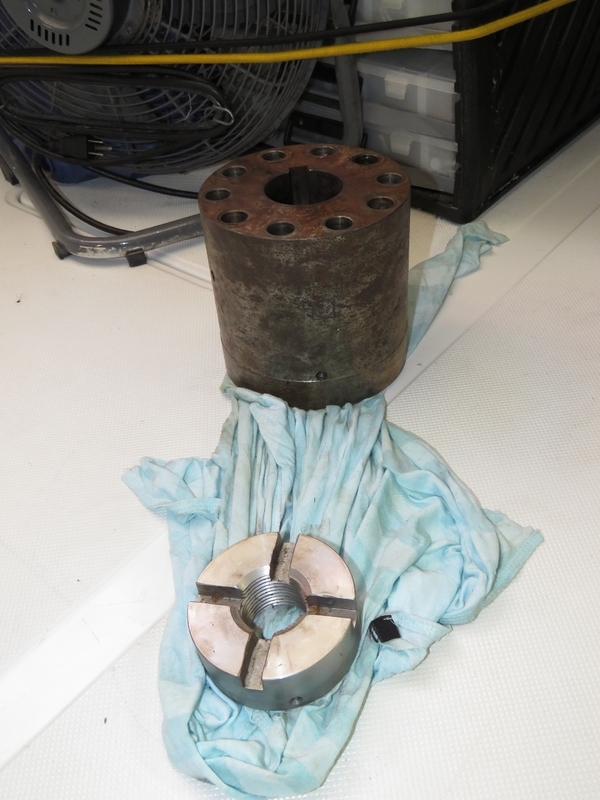 The rubber didn’t appear to be breaking down when we replaced our bellows. There was no obvious or outward signs of degradation but, as you know, that bellows failing would be a very bad thing so we lean to playing that decision conservatively. I have an idea to true the drive shaft casing. I put this idea forward as a junior engineer to yourself. I thought you could mill a spiral cut into the old drive shaft taper and use this as a bit to recut the shaft casing. 1 The old taper many not be a good fit as it is already worn. 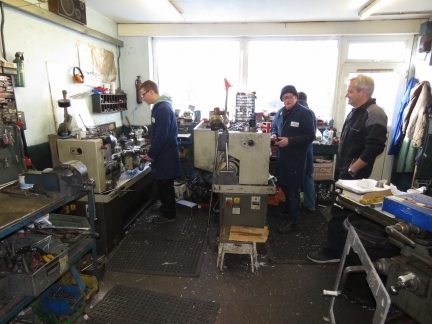 A new taper may have to be milled. 2 Consideration must be given not to over drill the taper. Stopping the spiral short of the bit ends should do this. 3 The benefit of this work may be insignificant. 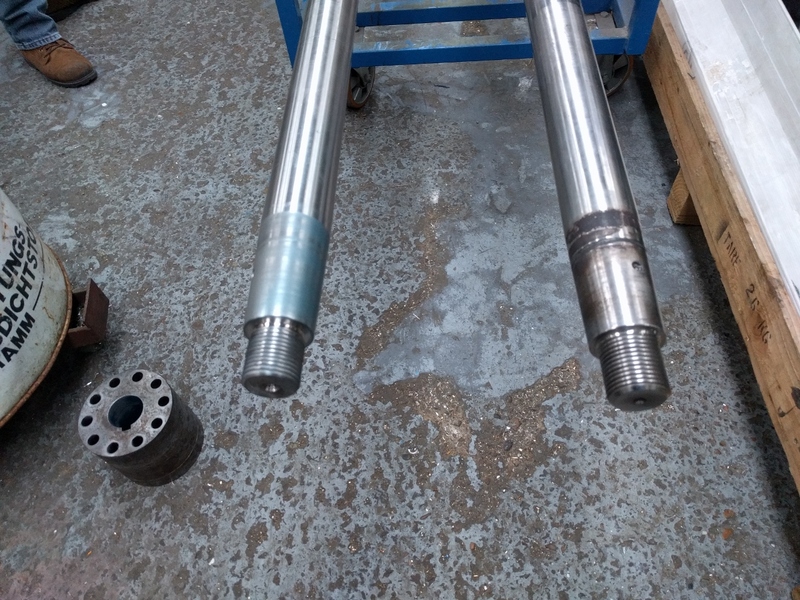 Time may bed the new drive shaft with the casing. To get maximum benefit the drive shaft may need replacing. Sorry misread blog. I think you have already fixed this. Thanks Robert. 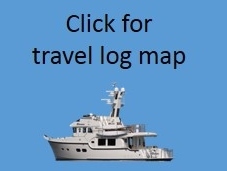 I always appreciate suggestions and, over the years, we have implemented many of ideas that have been posted here. Face-palm! 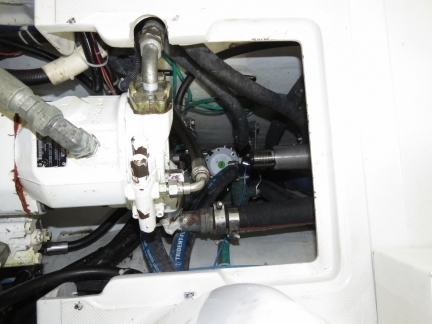 So that’s what the hole in the rudder is for! Yes, the hole in the rudder on Nordhavn’s is a nice design point that allows the prop shaft to be removed from the boat without dropping the rudder. Greetings from Seattle. 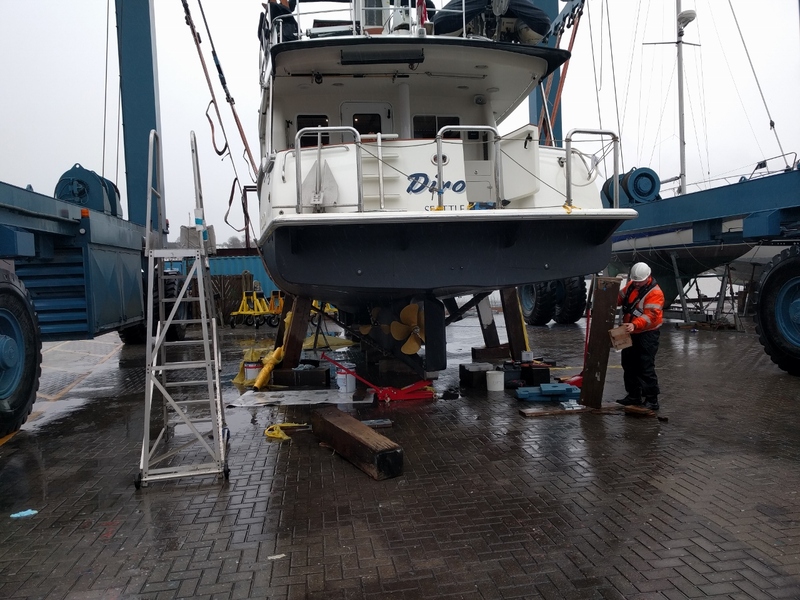 Specifically, on the hard at Delta Marine, where a few hours ago we replaced a Grade 17 propeller shaft with a Grade 22. The old shaft had a deep ring of crevice corrosion hidden under the propeller on our 1999 Krogen 48. 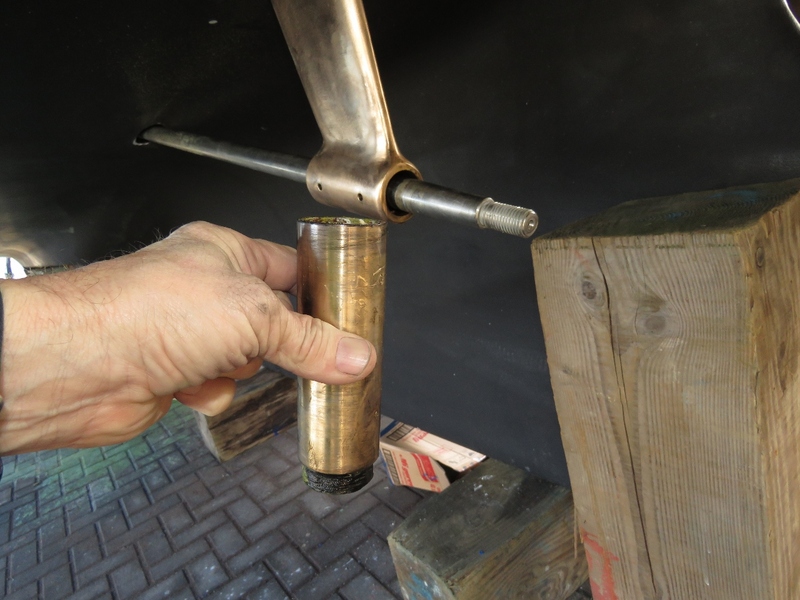 Was there any outward evidence that inspired you to inspect the lower rudder bearing? Was the rudder shaft loose in the lower bearing? 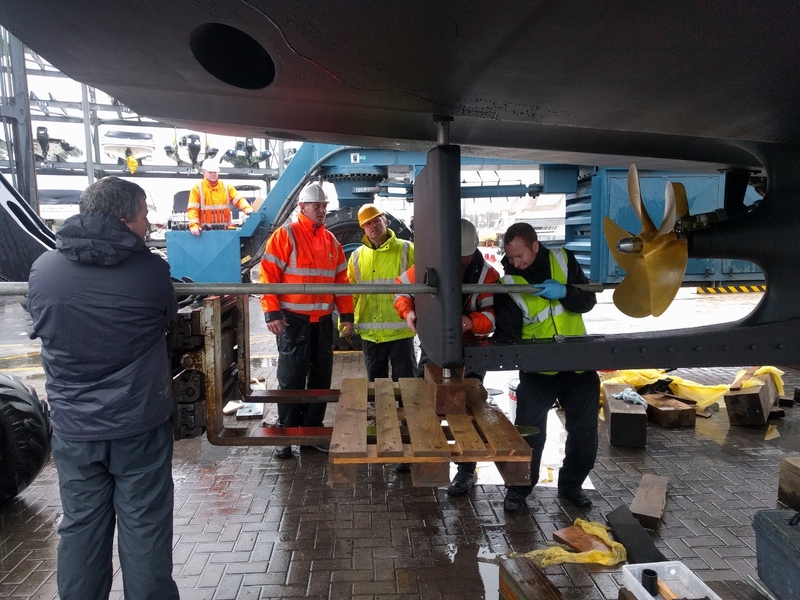 The loads on the rudder are extremely high and it’s a life critical component so, at 9,500 hours, we decided to take it apart to look for any problems or excess wear. There were no external signs of problems. 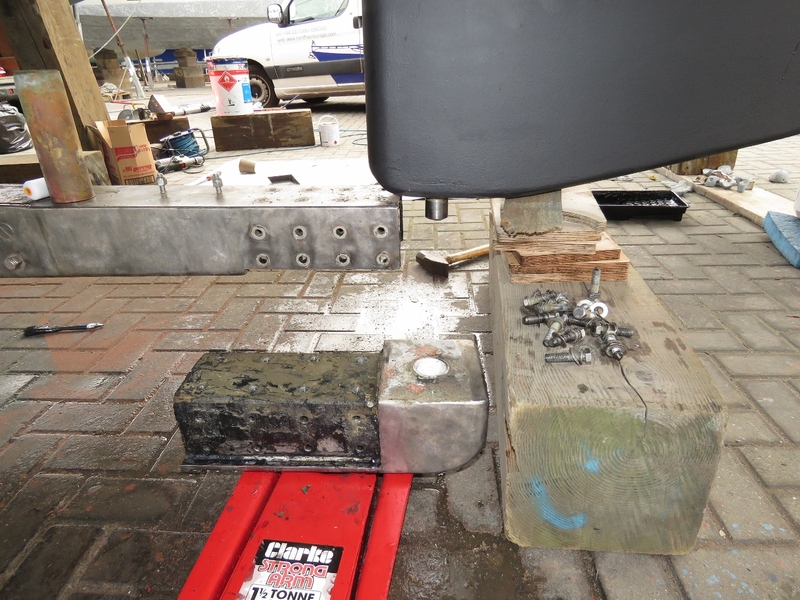 We just wanted to get a read on how the rudder and related mechanical systems were doing and replace any showing material wear. Enjoy your time at Delta. They have earned an excellent reputation for doing excellent work.